- Video Technology Manuals (VTM): These popular videos guide students through their statistical software use. 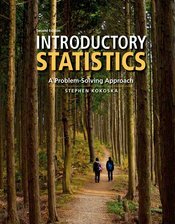 Available for Excel, SPSS, TI-83/84 calculators, JMP, Minitab, CrunchIt!, R Cmdr, and R.
- Math Review: This special content area provides practice with algebraic concepts and skills. - CrunchIT!, Macmillan’s Web-based statistical program with a familiar Excel®-like interface helps users carry out the statistical operations and graphing needed for an introductory statistics course and saves time when working with data.